Archos has revealed not one but four budget smartphones with humble specs to join its tablets in the Titanium line, making us want to break into song. 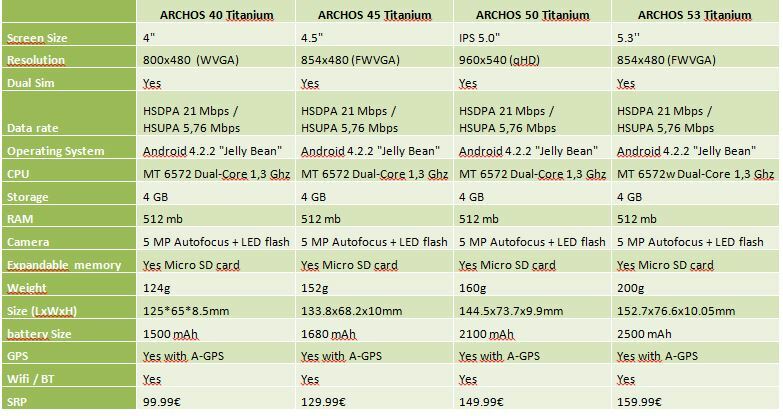 The new Android Jelly Bean devices are named after their screen sizes -- models 40, 45, 50 and 53 have displays that measure 4 (800 x 480 resolution), 4.5 (854 x 480), 5 (960 x 540) and 5.3 (854 x 480) inches, respectively. They have dual SIM slots that allow them to support 850/900/1800/1900MHz GSM, as well as 900/2100 WCDMA bands, and they connect to the internet via HSDPA+/HSUPA. On the inside, you'll the find the phones running on 1.3GHz dual-core MTK6572w processors with 512MB of RAM and, sadly, only 4GB of storage that makes their microSD card slots more valuable than ever. While the devices don't boast any fancy add-ons, they at least come with 5-megapixel rear and 0.3-megapixel front cameras. Availability seems up in the air at this point, but the phones' prices will range from €100 ($137) to €160 ($219) when they come out. Those who'd like to know more about the company's new set of quadruplets can head past the break for more info. DENVER, Colo. – October 17, 2013 - ARCHOS, a pioneer in Android™ devices, partners with MediaTek to release the ARCHOS Titanium smartphone line, with four mid-range fully featured smartphones with affordable prices starting at 99€. Featuring a stylish, easy-grip and slim body design the ARCHOS Titanium smartphones include large high-quality screens with amazing viewing angles, dual sim support with HSPA+ speeds for complete carrier flexibility and 5 MP back cameras for capturing the perfect picture. Fully Google certified, the ARCHOS Titanium smartphone range run Android 4.2.2 Jelly Bean, include popular Google mobile applications and have complete access to the Google Play store. "Our new Titanium smartphones make daily life easy by providing everything you need wrapped up in a powerful, feature rich phone package with a price that is hard to beat," says Loic Poirier, CEO of ARCHOS. "Thanks to our new partnership with MediaTek and their support, we are able to offer a range of unlocked phones at affordable prices without losing key features." "MediaTek is delighted that Archos has chosen the MT6572 3G+ platform as the basis for its new Titanium range of smartphones," said Siegmund Redl, Vice President and General Manager Corporate Marketing, Europe, at MediaTek. "The MT6572 integrates into a single solution a powerful 3G+ dual-core processor with advanced Wi-Fi, GPS, Bluetooth and FM functionality. Combining this with support for 3D Graphics, HD capable video and MediaTek's Miravision display enhancement technology, the MT6572 offers an outstanding user experience on Archos' Titanium range of smartphones."